The epidermal growth factor receptor (EGFR) gene is most frequently amplified and overexpressed, along with its truncated mutant, EGFRvIII, in glioblastomas. 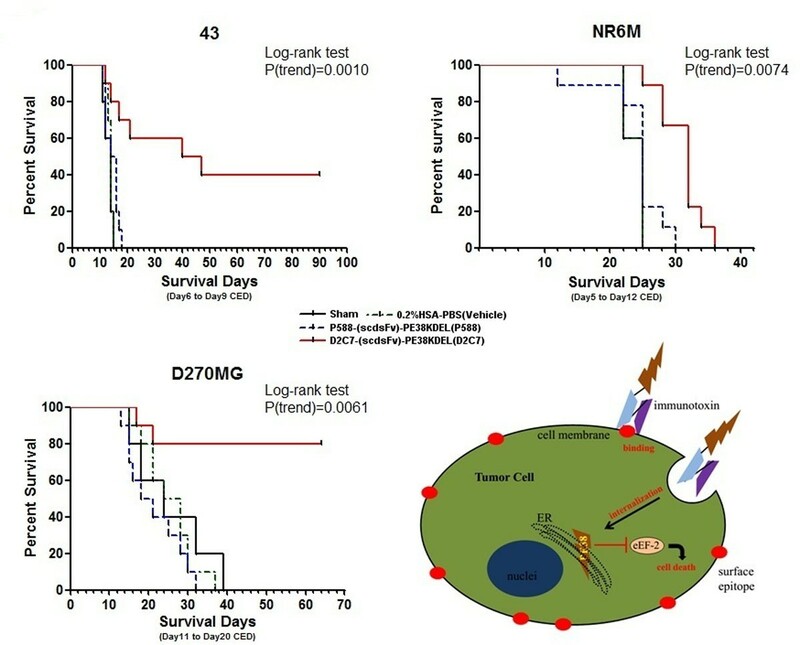 We tested the antitumor efficacy of the recombinant immunotoxin, D2C7-(scdsFv)-PE38KDEL (D2C7-IT), which is reactive with a 55-amino acid (AA) region present in the extracellular domain of both EGFRwt and EGFRvIII proteins (Figure 1), by convection-enhanced delivery (CED) in orthotopic brain tumor mouse models established with human glioblastoma xenograft cells. Orthotopic brain tumor models were established by inoculating 43 (EGFRwt expressing glioma cell), D270MG (EGFRwt and EGFRvIII espressing glioma cells), and NR6M (EGFRvIII expressing fibroblast cells) intracranially in the immunocompromised mice. CED was achieved by inserting a cannula into the brain tumor site, which in turn was connected to a subcutaneous osmotic pump delivering the immunotoxin into the tumor microenvironment. The antitumor efficacy was evaluated by Kaplan-Meier survival analysis. In the orthotopic brain tumor models of 43, NR6M, and D270MG, D2C7-IT therapy via CED significantly prolonged the median survival time (MST) of the treatment group by about 1 month (P=0.0010), 1 week (P=0.0074), and over 1 month (P=0.0061), respectively, compared with that of vehicle or negative control groups (Table 1, Figure 1). **Last 8 mice were euthanized on Day 64. In the orthotopic brain tumor mouse models, the D2C7-IT therapy via CED exhibited a robust therapeutic potential in treating brain tumors expressing EGFRwt, EGFRvIII, and both EGFRwt and EGFRvIII.